While most minivans feature conventional automatic gearboxes, the 2012 Nissan Quest uses a well-developed example of Nissan's fuel-saving continuously-variable transmission that makes the most of its V6 engine. Otherwise, the Quest is utterly conventional with flexible seating and a suspension tuned for ride rather than handling. Nissan quest for a large family. We had to buy a new car as we were expecting twins. I did not want a mini van, however based on our growing family it made the most sense. I liked the look of the quest and bought the basic no frills package. It has been great. No major issues. It is large enough to accommodate our family of 6. Even packing for a trip. It is roomy enough for us to be comfortable with our luggage. I should have bought the power closing doors and maybe the DVD for road trips. This has been a great car. My only issue is that at times, even in just rain is slips a bit. I replaced the tires shortly after purchase and this helped the issue, but it still happens more than it should. Otherwise it has been a really reliable, easy to drive car. 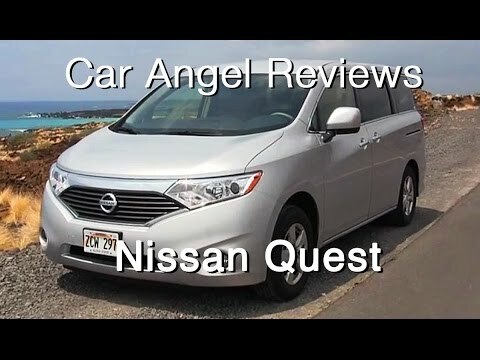 Review for 2012 Nissan quest. Awful traction and pretty bad offset crash results but other than that one of the best vehicles I have ever had. Extremely peppy engine and fairly economical for a van. 95, 000 miles and still going strong. Very roomy cabin and all the seat can be laid flat without removing them. There is plenty of space for a large family to travel. I like my vehicle because it has plenty of room for my entire family when traveling for vacation or just for errands. There is plenty of leg room and space to move freely. It also comes with a DVD player, backup camera and other features that make me happy.